Extang - The first 3-panel hard folding cover that provides both front panel opening and rear fold-up. The wider panel openings are more convenient for storing and unloading cargo. Simple: Our new low profile, hard panel tri-fold offers easy access from both front and rear. The Encore cover is self-positioning for pain free installation and self-latching for extra security. Engineered SecureShut? rear latch locks the cover at the tailgate; front panel has a separate rotary latch and lock. Superior: 1-inch thick SunStrong® panels, developed specifically for Extang, are FRP (fiberglass reinforced plastic) for superior UV protection and thermal ­­­stability. Textured OEM panels, powder coated frame and rubber corners are ExtangTuff to resist dents and scratches. The Encore's advanced sealing system is integrated with rails for the ultimate in weather protection. Secure­­Shut? your cargo. Heavy-duty rear latch locks the cover at the tailgate. Front panel has a separate rotary latch and lock. Engineered SunStrong® FRP panel keeps cover cooler and provides excellent UV protection. Textured, powder coated frame and rubber corners offer superior dent and scratch resistance. The Encore's unique channeling layers are integrated into the side rails for the ultimate in weather protection. 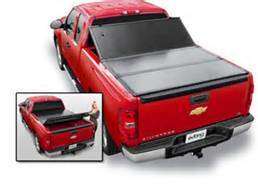 Self-locking pins position the tonneau on rails to provide a perfect fit. Heavy-duty aluminum extruded hinges give support across the entire tonneau.